SYS Yacht Sales is pleased to assist you in the purchase of this vessel. This boat is centrally listed by Italian Yacht Store. Ferretti Yachts came into being in 1968 when brothers Alessandro and Norberto Ferretti created the first nautical division of the family business, then a specialist luxury car dealership. Three years later, in 1971, at the Genoa Boat Show, their first model, a wooden motor-sailer, was greeted with great acclaim. This 10-metre yacht, equipped with both sails and an engine, was particularly comfortable and safe for leisure cruising. Their intuitive flair enabled Ferretti Yachts to figure on the list of the world’s most prestigious boatyards. In 1975, the Ferretti brothers decided to abandon cars altogether in order to commit themselves fully to the nautical world and the next decade saw the great leap forward – the switch from sail to engine power. In 1982 the first Ferretti motor-yacht made its debut and the company began producing boats for sport fishing, with an open and flying bridge, bearing witness to all the revolutionary changes that have transformed today’s boat-building industry: the stern bridge, the up-and-over salon windows that open onto the cockpit and the internal corridor from the salon to the flying-bridge. In the 1990s, Ferretti was dedicated to research and development in nautical engineering with the start-up of the in-house engineering division and winning performances in offshore races. Subsequent years have seen the range increase to its current size, but the story doesn’t end here, as there is constant renewal with state-of-the-art design solutions. The Ferretti Group is a world leader in the design, construction and sale of luxury motor yachts, with a unique portfolio of prestigious and exclusive brands, all distinguished by their distinctive and highly complementary characteristics: Ferretti Yachts, Riva, Pershing, Itama, Mochi Craft, CRN and Custom Line. 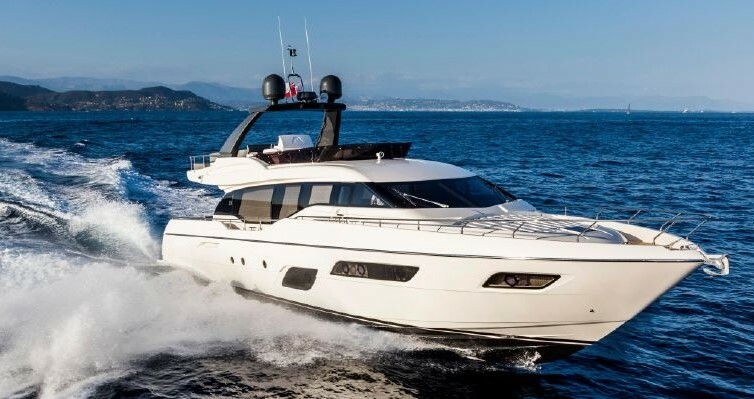 Buying a Ferretti: We offer used Ferretti Yachts for sale worldwide, including Ferretti Flybridge, Ferretti Motoryacht, Ferretti Navetta models and more. Contact our sales professionals for immediate assistance. Selling Your Ferretti: With a team of experienced yacht brokers and marketing professionals, we will employ a comprehensive marketing approach to ensure your vessel receives maximum global exposure online as well as exposure in person at major boat shows. Learn more about how SYS Yacht Sales will help to sell your Ferretti yacht!